Good. Cold tolerance varies with variety, and the hardiest daylilies can survive temperatures to -32C (-25F). Topdress established daylilies with rich compost in early spring, after new growth appears. Fertilise with a liquid fertiliser in midsummer to support strong re-blooming. Coreopsis. Daylilies are often planted among clumps of daffodils, tulips or other spring-flowering bulbs to hide the fading bulb foliage. Prepare a wide planting hole dug to at least 30cm(12in) deep, and generously enrich the hole with rich compost and a balanced organic fertiliser. Spread out the tubers and plant them so the top of the crown is just below the soil line. Allow 60cm (24in) between plants, which will grow into large clumps in a few short seasons. Daylilies can be planted closer when you are using them to cover a slope. Many newer daylilies will re-bloom all summer when provided with regular water and fertiliser. 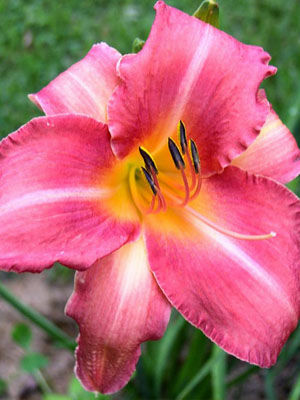 Daylilies with dark red blossoms often do best with slight afternoon shade. The buds of most old-fashioned daylilies are edible. Even though the individual blossoms last only one day, daylilies make interesting cut flowers. Mature buds will continue to expand and open after the stems are cut. As the flowers fade in the garden, trim them off with scissors or secateurs. Daylilies are often eaten by deer. Slugs can be a problem in spring in mulched plantings.